The Hanging Church in Cairo derives its name from its location on top of the southern tower gate of the old Babylon fortress, with its nave suspended over a passage. It is the most famous Coptic church in Cairo with the earliest mention of the church being a statement in the biography of the patriarch Joseph, who lived in the mid-19th century. It went on to become known to travellers as the 'staircase church' during the 14th and 15th centuries, because of the twenty-nine steps that lead to the entrance. The visual impact of the church's elevated position has been reduced due to the rise of land surface by around 20 feet (six metres) since the Roman period, not to mention the rise of tall buildings around it, but it is still an impressive and beautiful church. The Roman tower upon which it is built remains mostly buried below ground. 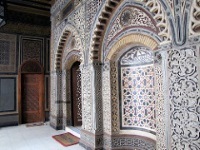 It is calm and peaceful inside and visitors are not pestered here as they may be at many other Cairo attractions. Among the highlights of the church are the intricate carvings and mosaics which decorate the walls, windows and doors.